Studios have jumpd at the idea of darkening up the comic book properties as much as they can considering the recent success of WB's The Dark Knight. Talks have even circled around the fate of Superman and if the property should be darkened for it's upcoming reboot that the Warner execs have recently talked of. No official word has been given to its fate or has any script even been approved. Mark Millar has recently pitched a 8 hour saga of Superman that would focus from Superman's inception to his demise as the last person on earth. 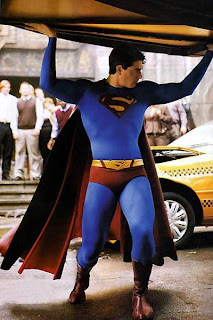 Now Brandon Routh has weighed in on the prospect of the next Superman film. Routh talked with IESB about the next potential reboot to Superman and what his take on the direction the next film/films should go. Routh was asked if he felt the next Superman film should get a darker treatment. Routh was very clear that he didn't think superman should go that particular direction. "I don't know, I don't think the character necessarily has to be darker, I think he is kind of dark in a sense, emotional dark," Routh said. Continuing Routh added, "You make the stakes higher, you make the villain darker, I think that's a way to do it. But I don't think Superman himself needs to be darker. He definitely has to struggle, how does Superman be a part of the world? And does he have to make sacrifices to be a part of that world? To fit in and what purpose does he really play in the world? Those are all kind of dark places to explore." Routh makes perfect sense and seems to have a good head for the direction Superman should take. Routh finally added, "I don't think Superman should ever be dark and brooding, that's not his nature. And that's now what people what to see." So true! Brandon Routh was also asked what villain he'd like to see opposite him in the next sequel. Routh was quick to reveal Brainiac as his top choice. Routh told IESB, "I think there are a lot of things you could do with Brainiac. He's been given a lot of power and a lot of different abilities over the years in the comics...I know that DC is working on a Brainiac storyline that they are excited about and I think combining the two and have that flow between the comics and the movie would be a nice thing. I honestly think there are a lot of interesting things you can do with Brainiac. Controlling people, controlling technology, a lot of cool things." What are your thoughts on Routh's comments? Should Superman be dark or just his villains? Would you like to see Brainiac as the lead villain? Who would be a good choice for Brainiac? Did you know when Tim Burton was rumored to helm a Superman film, Tim Allen was in talks to play Brainiac. Who would be your top villain choice? Nimoy says, "Live Long & Prosper!" The Wrestler Trailer & One-Sheet!! Stop All the Damn Foreign Remakes!! Could This Be Burton's Mad Hatter? Tatum as Captain America...Please God No! Dark Star Rises for Jerry Garcia Biopic! Stop Stirring the Wonder Woman Pot! Positive News for 28 Franchise! 8 Insanely Cool T4 Concept Images!!! Boo! Expendables Aims for PG13! Get Ready for Another 30 Days of Night! A New Hope, Obama Elected! Two Pics of Jason Vorhees New Victims! Spider-Man 4 Webs Itself a Writer! Hellraiser Remake Comes Back to Life? Hamilton Teases a Salvation Appearence! Preacher May Still Have a Prayer! !